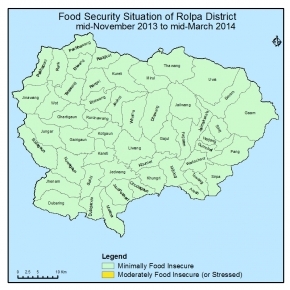 The Food Security situation was minimally incecure in this period. HH food stock was sufficient for 2-3 months. There was employment opportunity from some development activities, constructions and NTFP collections. There was also income from selling ghees, vegetable, potatoes , buffaloes, chicken and goats. Remittance was also the major source of income. The price of main staple foods like rice, wheat has been increased by 5-10% and there was sufficient food stock in the market to fulfill the demand. There was no natural disaster causing food loss. People coped with traditional mechanism as wage, out migration, sell of cash crops. There was peaceful situation and no bandh - blockade in this period in the area. FS situation will remain the same as minimally food insecure in next cycle. The HHs food stock (maize and paddy) will be decreased. Income from remittance and some employment opportunity from development activities and portering will continue as well to cope normally. Although market price may increase, there will be sufficient food stock in the market to fulfill the demand. civil security may be stable and hhs will cope traditionally as wage, out migration.